Richard Bong was one of the most successful fighter pilots his commanding officers had ever seen. Wikimedia CommonsRichard Bong in the cockpit of his P-38 Lighting. Richard Bong grew up a simple farm boy in rural Wisconsin whose head was always in the clouds. He was the oldest of nine children born to a Swedish father and Scotch-English mother, and he excelled at many things. Particularly, Bong loved shooting his Winchester rifle so much that he became an expert marksman. At the age of eight in 1928, Bong marveled at the airplane that flew over his family’s farm on the way to delivering mail to then-president Calvin Coolidge at his summer retreat in Superior, Wisconsin, 20 miles from the Bong farm. Both the marksmanship and love of flying came in handy in Bong’s later years as he turned into America’s most decorated flying ace. After high school, Richard Bong enrolled at Superior State Teachers’ College where he earned his civilian pilot’s license. In early 1941, even before America entered World War II, the accomplished pilot enlisted in the Army Air Corps Aviation Cadet Program. Very quickly, Bong’s career (literally) took off. He went to more advanced training in California and then Luke Field in Arizona. There, Capt. Barry Goldwater was Bong’s commanding officer. Hamilton Field near San Francisco was Bong’s next duty station in early 1942 after the United States officially entered the war. He earned his pilot’s wings and started training on Lockheed P-38 Lighting fighters. These twin-engine aircraft were fast, huge, quiet and deadly. In that year’s time, Richard Bong became both a legend and a nuisance. He flew loops over and under the main span of the Golden Gate Bridge. He flew low enough along Market Street to wave at stenographers and secretaries going about their daily duties. The daredevil pilot went so far as to buzz homes in Oakland. Bong flew low enough to the ground to disrupt a woman’s drying clothes — the prop wash from the Bong’s twin P-38 engines blew clean laundry off of a clothesline and onto the ground. Maj. Gen. George C. Kenney, the head of the Fourth Air Force, berated 2nd Lt. Bong and told him to put his skills to use in the field. He sent him to the Southwest Pacific Theater in Australia under Gen. Douglas MacArthur’s Fifth Air Force. 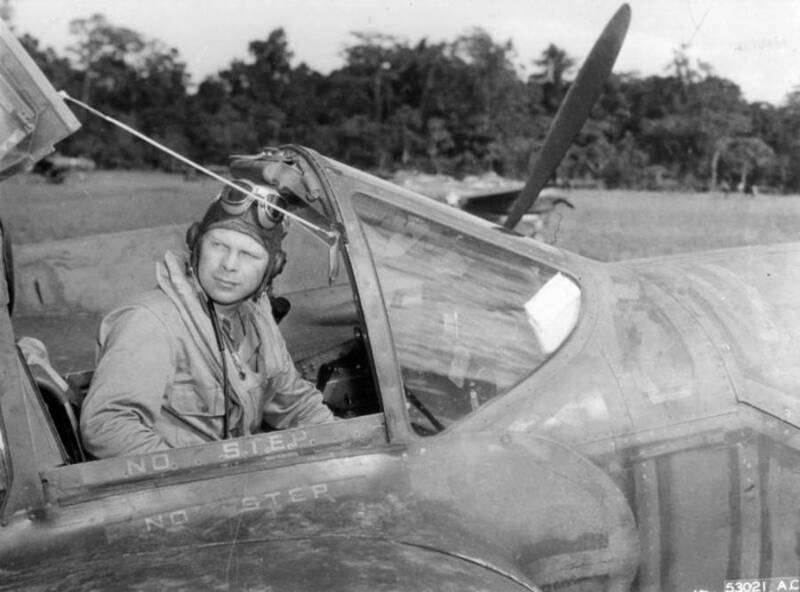 In November 1942, he was part of the 39th Squadron of the 35th Fighter Group. On Dec. 27, 1942, his group of 12 P-38s engaged a group of 40 Japanese fighters protecting a bombing raid headed to New Guinea. His group shot down 12 enemy planes, two of which were credited to Bong. His exploits earned him a Silver Star. Wikimedia CommonsMarge, Bong’s P-38 Lightning now at the Bong Heritage Center in Superior, Wisconsin. Less than two weeks later, he downed two more Japanese planes that were escorting a convoy reinforcing Japanese positions. A day after downing two fighters, he added another kill to his total. In two weeks’ time, Bong downed five enemy planes. He earned the Distinguished Flying Cross and an official “ace” designation. Throughout 1943, Bong’s exploits continued. The daring pilot never backed down from an air-to-air fight. His squadron was over the Markham Valley near Lae, New Guinea, when the men intercepted 20 Japanese planes. Bong missed enemy planes on his first pass, but then he dived his P-38 to gain speed before heading back towards the Japanese planes head-on. He gunned down one plane as it flew towards him before banking and taking out another. This engagement alone saw Bong take out four planes on his own. Mere weeks before, in early June, Bong returned to base with a flat tire and his tail riddled with bullets from 7.7 mm rounds. Bong loved every minute of it. The intrepid combat pilot received a promotion to 1st lieutenant April and then to captain in August of 1943. As a captain, Richard Bong was put in charge of replacement airplanes in New Guinea at the Fifth Air Force’s headquarters. 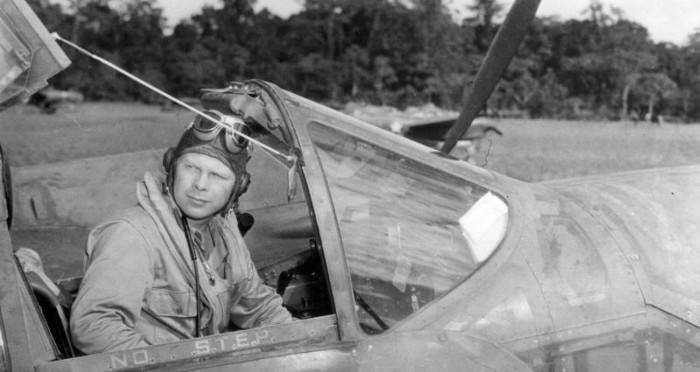 Even though the captain had his regular duties, he continued to fly combat missions in P-38s. Along the way, Bong formed a deep friendship with fellow ace Maj. Thomas J. Lynch. Both men could fly whenever they wanted to as they didn’t have an affiliation with one fighter group. 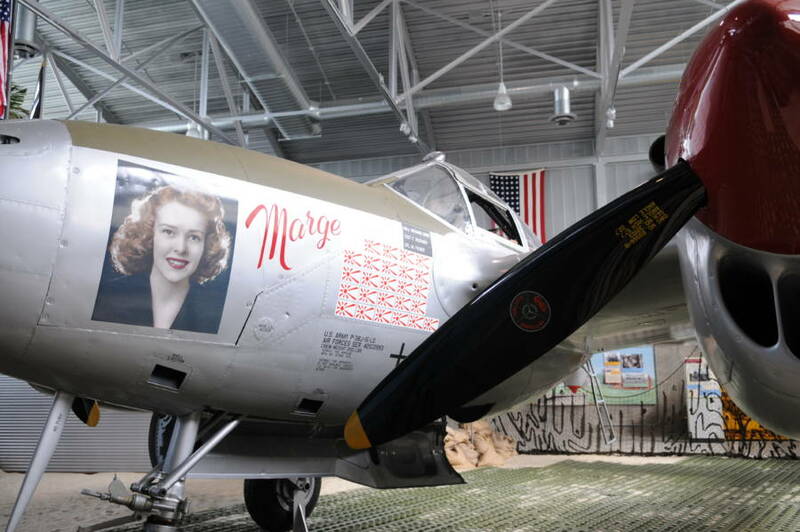 In March 1944, Bong took off on a mission with Lynch in his new silver-aluminum P-38 nicknamed Marge, named after Bong’s longtime love. As the pair approached Aitape Harbor in New Guinea, Lynch’s P-38 caught small arms fire in his engines. Bong radioed to his buddy to bail out, but it was too late. Lynch’s plane exploded seconds after he ejected, and Bong had to return his own plane to the base as one engine had already failed. Later that year, Richard Bong increased his enemy kills to 28. At this point, he surpassed the enemy kill rate of Eddie Rickenbacker, who downed 26 enemy kills during World War I. Rickenbacker sent the new Ace of Aces a personal message of congratulations. By April 1944, he earned a promotion to major and was sent back to the home front in Texas to train incoming pilots on P-38s. In September of that year, Bong returned to the Pacific because the lure of flying combat missions was too great. Clearly, Bong’s commanders felt he was more valuable on the front lines. 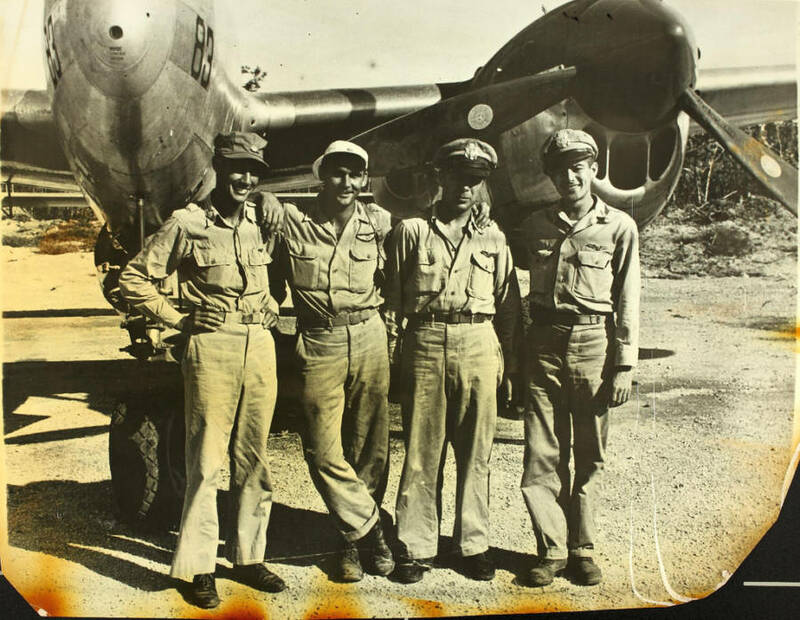 Flickr.com/SDASM Archives Richard Bong, second from the right, with some of his fellow fighter pilots in New Guinea. In early 1945, the Ace of Aces married Marge. He was reassigned to the Flight Test Section of Wright-Patterson Air Force Base to test a new plane, the Lockheed P-80 jet fighter, starting in June of 1945. On Aug. 6, 1945, Bong entered the cockpit of a P-80 after logging four jet-flying hours in the plane. Witnesses saw black smoke coming from the aircraft shortly after takeoff. The jet flipped over and made a nose-dive for the ground. Bong’s body was found 100 feet from the crash site, wrapped in his parachute that failed to deploy properly. Investigators determined that Bong failed to engage the “takeoff and land” backup switch for the electric fuel pump. The engine stalled shortly after takeoff. It was an abrupt end to a glorious career. Rather than dying facing an enemy, America’s greatest flying ace perished in a simple training accident. Ironically, Bong died on the same day that America dropped the atomic bomb on Hiroshima. Richard Bong was only 25 years old. In just seven years in the military, he had lived more adventures than most people have in a lifetime. After learning about Richard Bong, America’s best World War II fighter pilot, check out the story of Bessie Coleman, the first black female fighter pilot in America Then, check out the story of Lady Be Good, the lost American bomber.